There are many variations on this simple pancake-style potato dish, from the Swiss rosti, through Polish and Czech versions, landing on an Israeli interpretation, the latke, a Hanukah staple and speciality. Latkes are at their best when made and served immediately. Making the mix too far in advance allows the potato to brown and take on an unappetising look, leaving them standing after cooking lets the essential crispness of fried potato slip away. Latkes should be crisp, hot and taken straight from the scorching pan to hot plates and onto a table, with as little waiting around as possible. This version is a mix of potato and parsnip, a great way of hiding some extra vegetables away from unsuspecting young eyes … the parsnip is indistinguishable to the eye, but adds a subtle flavour and a welcome softness to the finished latke. The best potatoes to use are Desiree, but anything on the slightly waxy side will do. Floury potatoes will disintegrate too easily, and you’ll be left with cakes of mashed potato. They’ll taste good, but the point will be lost. Peel the potatoes, about 600g worth, and grate them using the coarse side of a grater. A food processor with a grating disk makes this a doddle. Rinse the grated potato in a big bowl with plenty of water, and drain it in a colander, pressing out as much water as possible. Spread the grated potato out on a large tea towel and let it dry out completely. It needs to be quite dry. Peel and grate 300g of parsnips, and put them in a large bowl with the now-dry potato, and add four egg whites, two tablespoons of cornflour, a teaspoon of salt and plenty of ground black pepper. Mix everything together well. Heat about 50g of vegetable oil and 20g of butter over a medium high heat in a large frying pan, and when it’s hot, form a latke from about two tablespoons, or a small handful, of the mixture. Squeeze the mixture hard in your hands to get rid of as much liquid as possible – there will be quite a bit, and form it into a patty about eight centimetres wide and one centimetre thick, and carefully place as many as possible into the pan without overcrowding it. I managed four. Let the latkes fry for three or four minutes, turn them over and cook for a similar length of time. They should be uniformly brown. Drain on kitchen paper and serve straight away as a side dish. Sour cream to dollop on top is a good idea. Since the beginning of the year I am fascinated by your writing about food reading lots of your old posts. I wish I could capture my audience like you do. Being Austrian I know my Kartoffelpuffer and Roesti’s. Rosti is coming from Switzerland and never uses eggs and flour. Rosti’s are very difficult to make. Either they are burned or soggy. 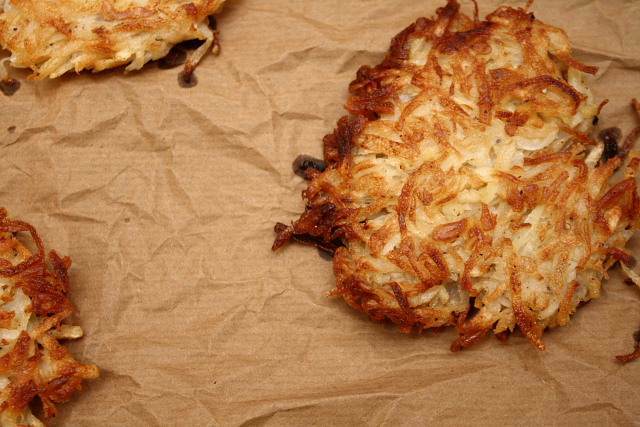 Latkes is like a Kartoffelpuffer (Germanic) – potato pancake. Thanks for the very important comment to use the correct potato. These look good. I like them with apple sauce, and indeed the Germans as noted in the comment above make something very similar – the two dishes probably originated in the same place around the same time. I agree about the grater, for some reason a latke tastes better when the potato is ground a certain way, into those little strips. What your image shows looks exactly right. In Canada we use corn (maize) or canola oil for them, whose neutrality seems to suit the dish. Olive oil is rather rich not to mention fats derived from poultry. It always surprised me the English, who have a way with potato dishes, never evolved something similar. I would think the closest dish is the round deep-fried balls which are mixtures of minced cod or other white fish and potato. Fish balls is it, what do you call them? One of the great English food writers, perhaps Jane Grigson, deprecated them on the ground of being too heavy and dull. Perhaps she had bad luck with her sources for these but I’ve had excellent ones in London, e.g., they benefit from a dash of good black pepper and of course a light touch with the potato blend). This seems to me the closest the English have to it, but maybe I’m wrong.